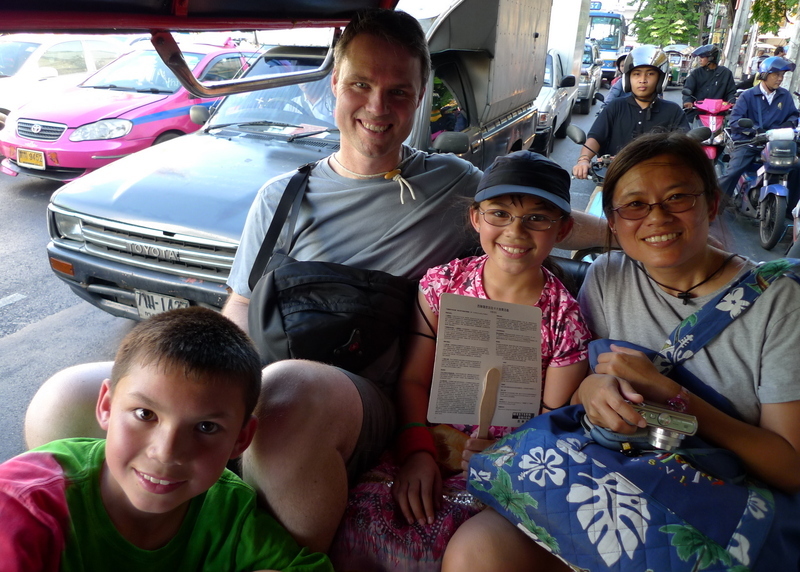 Agents C and E, the 8- and 10-year old children of my visiting childhood friend Brad and his wife Donna, continued their top secret assignments, learning more about Thailand while gathering intelligence for Agent X back at headquarters. The assignment started with another code breaking exercise to discover the destination of the trip: Mahachai in Samut Sakhon province. Last month, my friend Bill and I took a day trip by “the train to nowhere,” a two-part line disconnected from the rest of the State Railways that runs to Samut Sakhon and then on to Samut Songkhram provinces. Link here. I decided that this would be a fun opportunity for Agent C and E to see what life was like outside of Bangkok. 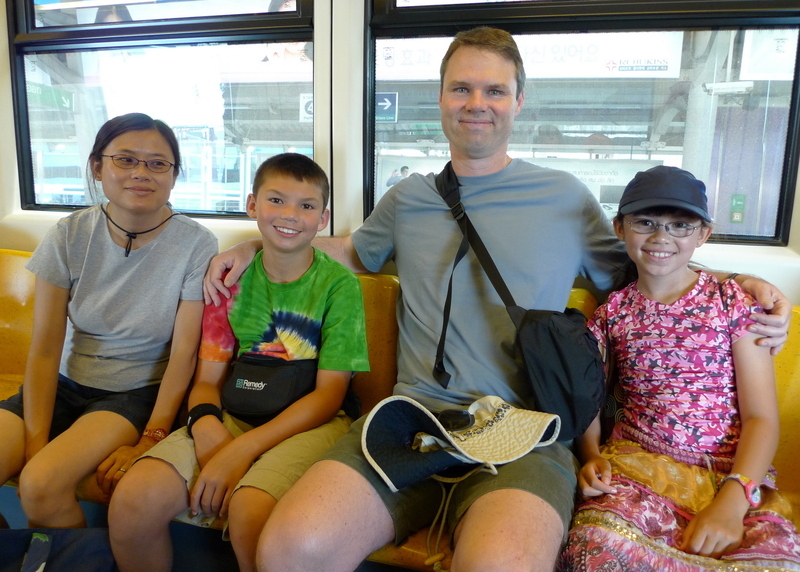 Our first mode of transportation was walking – one common to many people in Thailand – but thankfully we only had a short distance to cover before we could switch to an air conditioned mode of transportation: the Skytrain. Part of the code-breaking had included unscrambling the names of key stations on the Skytrain line as we connected in Siam and then continued across the river to Wongwian Yai. From there we took a taxi – transportation mode #3 – a short distance to the Wongwian Yai railway station. While waiting for the train, we were able to look at some of the different foods available from the vendors, to get an idea of what Thais eat for breakfast. 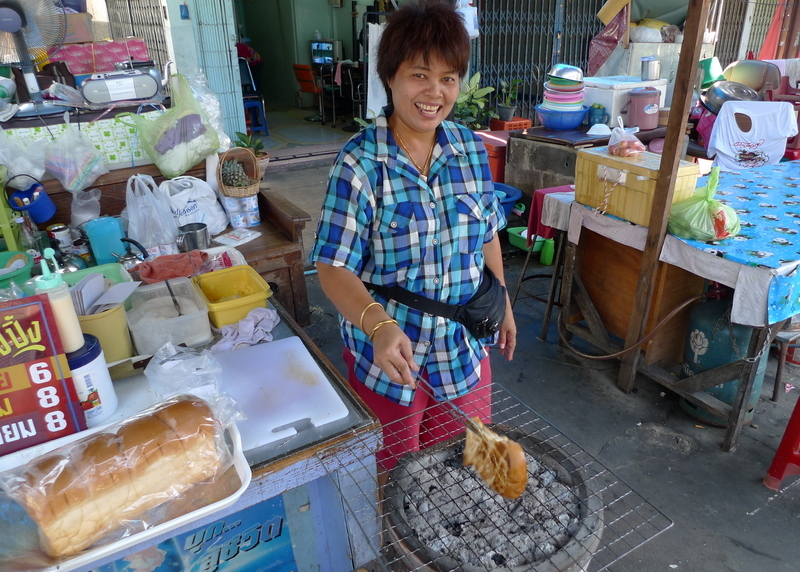 We snacked on something not too exotic – grilled toast with a little condensed milk on it. 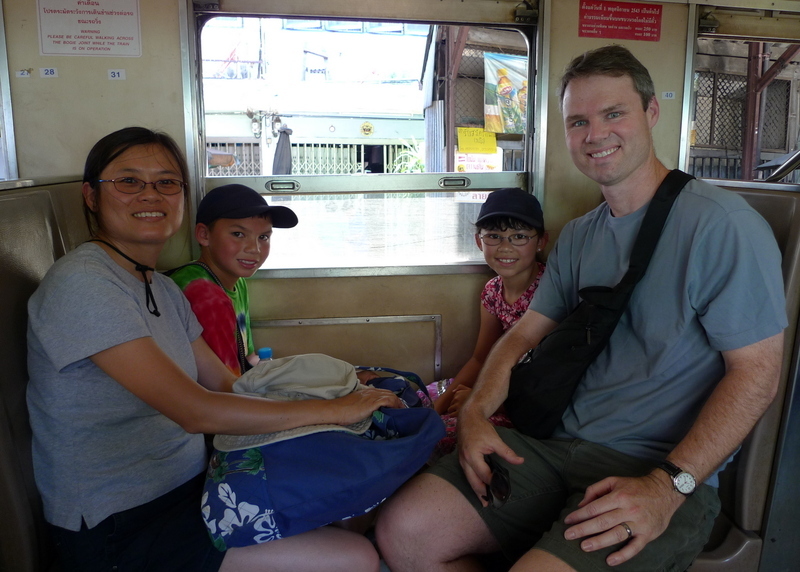 We bought our tickets then boarded the train – mode #4 – which ended up being pretty full. The ride was an hour long and along the way, the two secret agents and I walked the length of the train to see what we could learn about the people who ride it. One thing we learned is that crossing from car to car is pretty scary, especially when the train is moving! Thankfully, there are rails to hold onto and you’d be hard pressed to actually fall onto the tracks. But it as still thrilling. 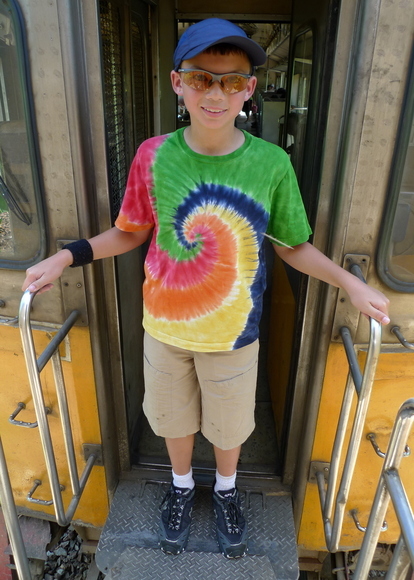 We were able to go to the engineer’s cab at the back end of the train and see the controls they use to drive it. Along the way, we met some interesting people. There were lots of vendors moving their wares to market, families traveling with children, and older folks getting from place to place. They seemed fascinated with Agents E and C, and had lots of questions about them. One man, seeing my camera, wanted to pose with Agent C for a picture. It was a little strange being the center of attention when you’re on a covert mission, but Agent C handled it with grace, flashing a big smile at everyone. When we arrived in Mahachai an hour later we returned to the walking mode and visited a local market and the city pillar shrine, where preparations were underway for a large festival, before heading to the Ta Rua (“Boat Pier”) restaurant on the edge of the river. While Agents E and C aren’t big seafood people, they bravely tried several new things while we sat on a shaded outdoor dining terrace and enjoyed the cooling breezes. Two hours later we were back at the train station, grabbing our seats for the ride back to Bangkok. 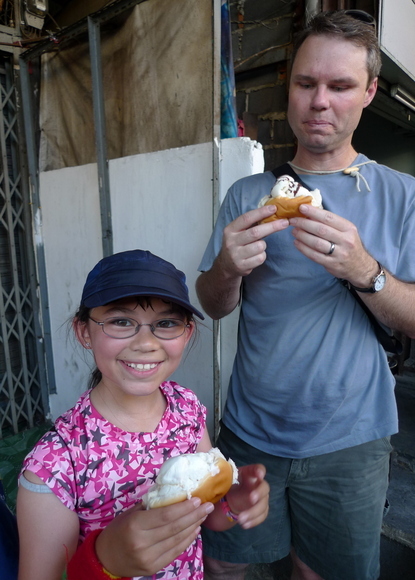 Before trying our fifth mode of transportation, we needed a little pick-me-up, so Agents E and C (and their father) tried some coconut ice cream served the way street vendors have been selling it for years: in a sweet bread bun. For the final mode of transportation the five of us crammed into the back of a tuk-tuk, the noisy little three-wheeled vehicles named after the sound their motors makes as they run. We drove around a large traffic circle and five minutes later were deposited next to the Skytrain station for our trip back to the hotel. After all that transportation, Agents E and C were ready for something new: Thai foot massages! What a relaxing way to end their assignment. This entry was posted in Uncategorized and tagged Bangkok, Clevelands, Khrungthep, Mahachai, Samut Sakhon, Thailand, Tourism by christao408. Bookmark the permalink. Again, how imaginative, Chris — are you a teacher, or have you been? 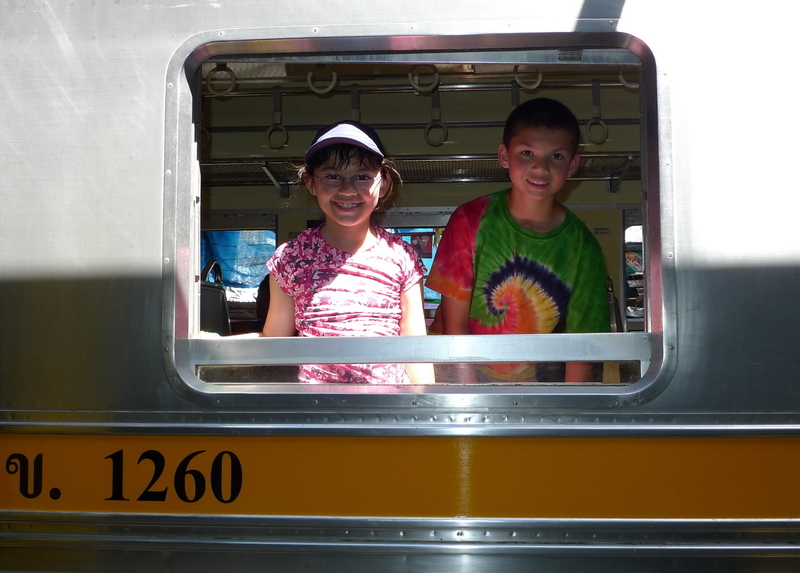 A great trip for the kids! The fun part of this intelligence gathering operation is trying delicious street food, right? Brad is looking a little big for the tuk-tuk! Sounds like everyone had fun and it was a great way for Agents E and C to learn more about the Thai culture. Keep up the creative work! you are giving the agents the thrill of their lives, not to mention the treasures of memories they are going to hold on to for the rest of their lives. Way to go Chris! Clevelands look great and seem to be having a good time. Agents E and C are certainly courageous. A foot massage sounds lovely after such a long day – hope you indulged in one too! HEY! Why didn’t I get to go on a Top Secret Assignment when I was in Bangkok?Sounds like great fun (not to mention a great way to learn something). @murisopsis – Actually, I took advantage of their reservation and used the hotel’s gym. @jandsschultz – Relatively speaking, they are courageous. Interesting to observe that C is more likely to try something first and E will follow only when he sees that it is safe or there is little risk of embarrassment. @marc11864 – I wish I had known some of these places when you were here. We could have definitely expanded your scope of sight-seeing. @TheCheshireGrins – Yeah, I think it is a good one, too. Another one that I’ve considered is taking the train up to the bridge over the river Kwai. That’s about 3 hours away. @Chris – I saw the sights, it’s the treasure hunt that I want to do! 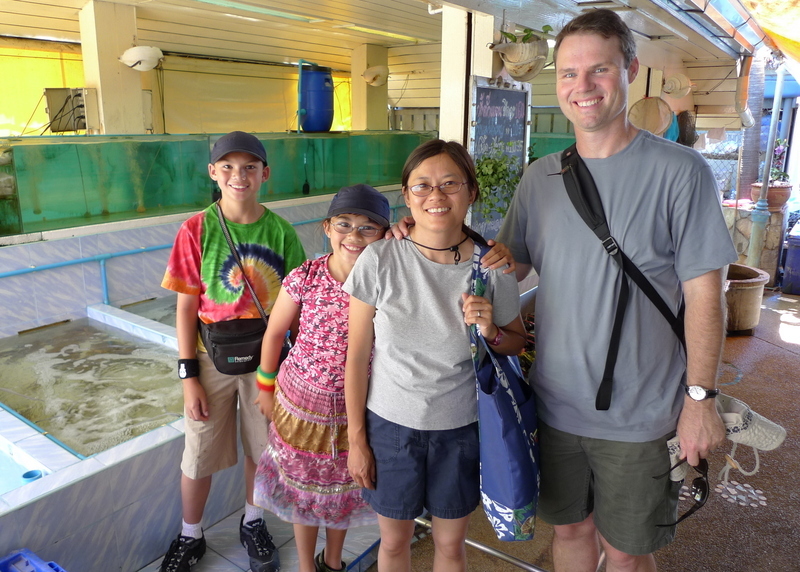 You should start a business creating fun adventure tours for parents and their kids! It’s a great way for them to learn without realizing they’re doing it. @christao408 – I really, really liked that movie! It sounds like the mission is going great and the agents are taking it seriously and having a great time at it too !Ice Cream in a bread bun ! I take it the said bread bun is nothing like the ones we have here which would more likely end up a soggy mess ! Lol Yours do ‘look’ like normal buns though. @Chatamanda – The bread buns are slightly sweet, like Portuguese bread, and substantial enough to hold up to a bit of melting ice cream. Kind of like a sturdy dinner roll.